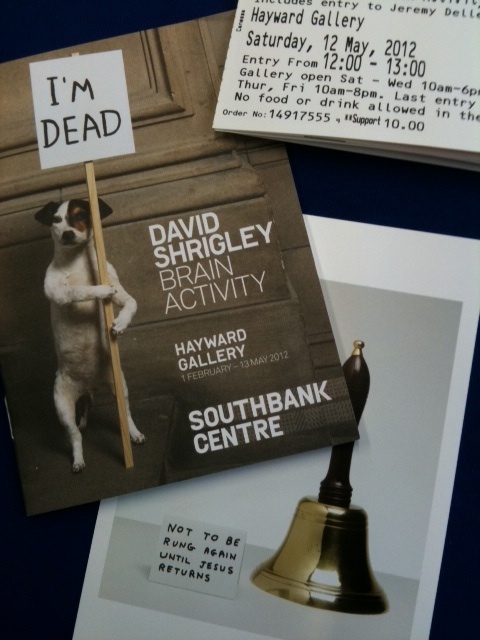 Before the weekend, I told you that I was going to the David Shrigley exhibition at the Hayward Gallery and I’ve been looking forward to telling you all about it. Firstly I must say ‘sorry, folks’ — I went on the last day, so this is a retrospective review, not a call to go and see it but there’s always other exhibitions, his books and online to check out. I love Shrigley for his laugh-out-loud art, which delivers visual puns and more than a hint of a dark, maladjusted world. He is most known for his comical stick men drawings and quippy text. Trained as a fine artist, Shrigley dismissed perfection to make rough, amateur line drawings. It seems an odd choice but not when you consider his aim to make light of strange situations. His jokes just couldn’t be delivered in the same way with fine art as a medium. Shrigley not only produces a character on the page but also above it — he creates the persona of the artist, not himself but a weird and disarming character who even Shrigley says he wouldn’t want to meet. I imagine the strange boy at school who everyone is fascinated by but far too scared to go near. 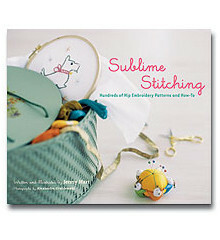 The viewer is brought into the ‘artists’ world and can immediately see things are off kilter. If you enjoy his drawings I recommend his books, which always bring a chuckle. But the exhibition delivers more. His taxidermy animals probably pack the most impact. A stuffed headless ostrich stands proud – (where is the head, in the metaphoric sand?) A decapitated squirrel holds his head like a nut. A stuffed Jack Russell holds a sign saying ‘I’m dead’. Shrigley has a similar sculpture, a stuffed cat holding the same sign. When I first saw it (in a gallery setting), I laughed out loud at the absurdity of it. But try explaining the joke (try explaining any of his jokes) and it’ll fall flat. In this case, I was quite surprised that I’d laughed at a dead, stuffed animal – especially as it was so cute, but that’s what his work does. It pulls you into something a bit dark and twisted, and you become a part of it. Once you’ve seen his work, you’ll notice the ‘Shrigley effect’ all around you. For example, the Ed Monkon greetings cards, I’m also convinced his style has influenced a number of illustrator friends. If you’ve not already fallen in love with Shrigley, give him a try – I guarantee it’s worth the giggle. P.S. 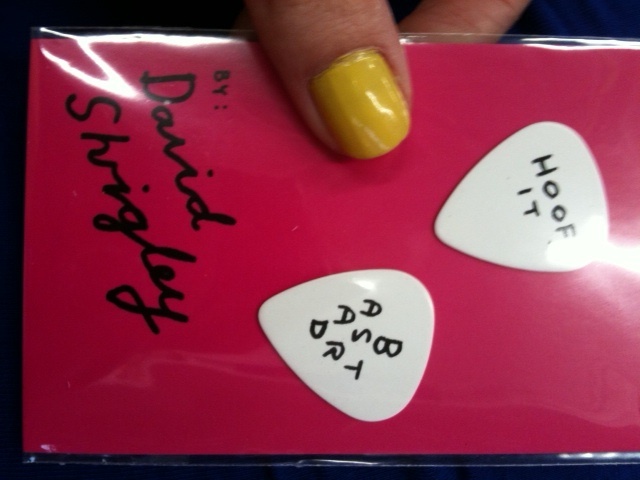 Not one to slack off from crafting, I bought these Shrigley plectrums from the gift shop. 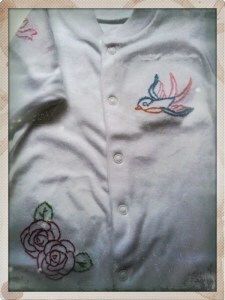 I’m thinking with a bit of trickery, one will be a brooch, the other a pendant a la Tatty Devine.